Kavita Beri, MD, is Attending Physician, Jersey Shore University Medical Center, Department of Medicine. A. Yasmine Kirkorian, MD, is a Pediatric Dermatology Fellow and Faculty Instructor, John Hopkins University. Amy Pappert, MD, is Program Director, Department of Dermatology, Robert Wood Johnson University Medical Center. Sandy Milgraum, MD, is Consulting Pediatric Dermatologist, Robert Wood Johnson University Medical Center. Address correspondence to Kavita Beri, MD, 3200 Sunset Avenue, Suite 107, Ocean, NJ 07712; e-mail: kavitaberimd@yahoo.com. An 8-year-old girl presented for evaluation of a rash present since infancy that had recently began spreading over her body. The eruption began on the central chest and gradually spread to the upper chest, and medial aspect of the arms, forearms, and thighs. The lesions were occasionally pruritic but otherwise asymptomatic. The patient was treated with a course of topical hydrocortisone valerate by her pediatrician with no change in the lesions. The patient had no significant past medical history and had met all developmental milestones appropriately. Family history was unremarkable with no similar rash noted in any other family members. Physical examination revealed a healthy, well-developed, 8-year-old girl. Evaluation of the skin revealed hundreds of tan-brown, 1- to 2-mm papules distributed on the upper chest, flexor surfaces of the arms, the forearms, and in a band-like distribution across the upper thighs (Figure 1). Hundreds of tan-brown, 1- to 2-mm papules distributed on the upper chest, flexor surfaces of the arms, the forearms, and in a band-like distribution across the upper thighs. Images courtesy of Kavita Beri, MD. A 2-mm punch biopsy of the left arm was performed for histopathologic analysis. Hematoxylin-eosin staining demonstrated a cyst lined with infundibular epithelium containing cornified cells and numerous vellus hair shafts (Figure 2A, 2B). Eruptive vellus hairs at 10x magnification (A) and 40x magnification (B). Most lesions are asymptomatic except for rare reports of associated tenderness or pruritus.7,8 The cosmetic appearance is often the primary concern for patients and their families. 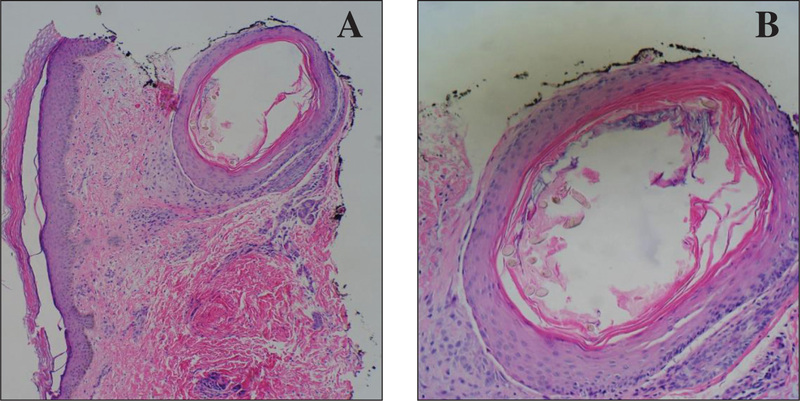 A cyst extraction method using local anesthetic cream was reported by Karadag et al. in which an incision is made in the surface of the cyst and the cyst material is extruded. Microscopic examination of the extruded cyst contents with 10% potassium hydroxide is diagnostic and reveals multiple vellus hair cysts within the pink keratinaceous material.9 Spontaneous resolution has occurred in some cases. Treatment options include 12% lactic acid and retinoid preparations; one case report describes the successful use of calcipotriene cream.10–12 Surgical techniques such as curettage and incision and drainage have been used but have a risk of scarring. Laser therapy using a CO2 or erbium: yttrium-aluminum-garnet (Er: YAG) laser has been tried as well. These approaches enable rapid treatment of multiple lesions; however, there is always a risk of inconsistent results and scar formation.13 In the case described here, after a discussion of the benign nature of condition, the family opted for no treatment. Clinical recognition of EVHC and knowledge of the benign nature of this condition permits reassurance of the patient and parents. Treatment options can be discussed with parents who are concerned about the cosmetic appearance of the lesions. Karadag AS, Cakir E, Pelitli A. Eruptive vellus hair cysts: An alternative diagnosing method. Indian J Dermatol Venereol Leprol. 2009;75:537–538. doi:10.4103/0378-6323.55421 [CrossRef]. Erkek E. Eruptive vellus hair cyst: report of pediatric case with partial resoponse to calcipotriene therapy. Cutis. 2009;84(6):295–298. Each month, this department features a discussion of an unusual diagnosis. A description and images are presented, followed by the diagnosis and an explanation of how the diagnosis was determined. As always, your comments are welcome via email at pedann@Healio.com.